The Mixed Media Card Challenge !!! I tried to use lots of textures, but not overwhelm the card. I just got this new stamp set by Penny Black called Blooming Tags. I stamped it on watercolor paper and then colored the image with Ranger Distress markers. Beneath the tag is a die from Tim Holtz for Sizzix called Trellis. The background paper was inked with Disress ink. I then added texture with some white embossing paste that I mixed with Watermelon alcohol ink to get the matching ink color. Lastly, I added ribbon, twine and black gems. And there you go! I am so excited about this new challenge! It is gonna be lots of fun! Mackie this is wonderful! I love that gorgeous tag and the colors you used! Hope you had a nice holiday! LOVE your card. So many beautiful elements and layers ... and the texture - awesome! 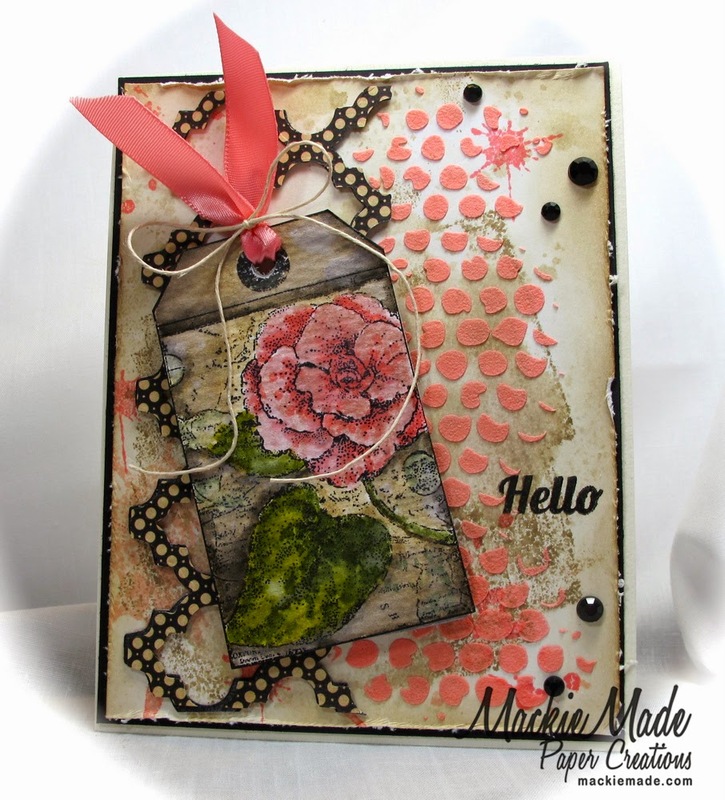 So glad you are playing along with us at Mixed Media Card Challenge! Oh my gosh, love all the textures you used AND the gorgeous colors! The polka dots look great in that color! Love everything about this tag card Mackie. Hope all is well with you. Wow! What a fab card! Love all the texture and beautiful color! Gorgeous Mackie! Love all the layers and texture! That blossom is stunning! Beautiful card - love that watermelon stencilling! LOVE all the textures , a fabulous card!!!!! gorgeous design and texture!!! 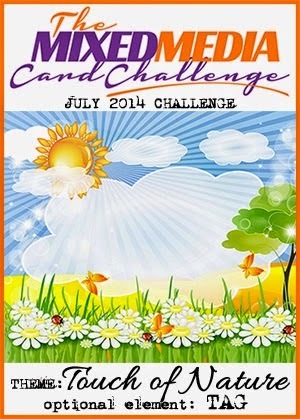 thanks for playing along with us at The Mixed Media Card Challenge blog! I am in LOVE with this card, Mackie! The colors, the textures, the Penny Black stamp! You rocked it! Just FAB! Oh, how pretty! Love the flower image and the coloring on the tag... great textures on the background. Just gorgeous! I love how you coloured the texture paste, and your bloomin tag is so amazing! Gorgeous textures in this card and great coloring on the tag!